CoreCivic Properties can design, finance and build a brand new facility, but we can also provide a lease-only option in which we provide a ready-to-go facility, assume all maintenance, while our partner manages daily operations. 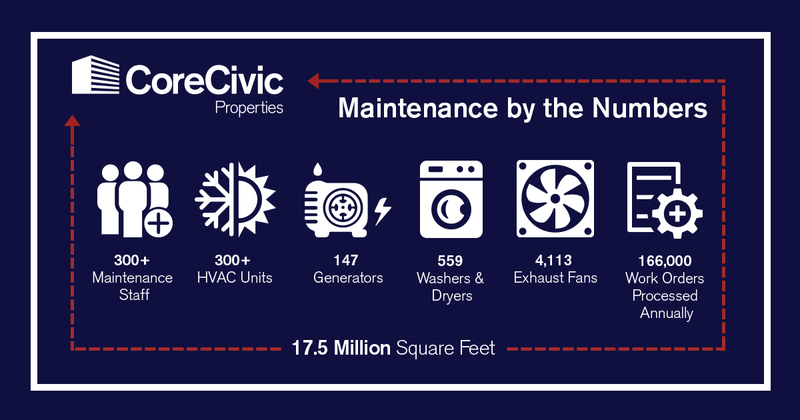 With more than 17.5 million square feet under management across the country, CoreCivic Properties has the most diverse and comprehensive maintenance program for criminal justice facilities in the nation. We employ more than 300 maintenance staff who are responsible for regular corrective maintenance, helping our facilities operate safely and smoothly. With our lease option, we assume all facility maintenance - providing maximum flexibility for government partners. We have decades of experience in managing correctional real estate projects from the ground up, saving time and resources. For more than three decades, CoreCivic has provided quality correctional facilities for government partners across the U.S.